I love New Orleans, beautiful Jazz music is everywhere. I have been to New Orleans two times, the first time before Hurricane Katrina, and the second time after Katrina. Yes I found lots of differences after that natural disaster. The first time when I visited it was full of hush and bush, Jazz music was everywhere, it was really fun to walk around the river walk, French quarter etc. However after Katrina, when I went, shops on the river walk were closing at 6 PM and nobody there in the street by dusk. It was in 2007 that I last visited, and I don’t know about now. May be one day I will visit New Orleans again, perhaps I would get a chance to visit during the Mardi Gras festival. Muddy Mississippi river is flowing as it was before, she doesn’t know anything that the happened to the city. French quarter is active in the night, and both times I went for conference and stayed at the same hotel. I had fun there. My hubby always tells me you visited New Orleans, and I didn’t, you did not take me along. I always tell, that is all for research conference, if you want we can visit now. We are still debating on it when to visit. New Orleans has lots of history just like any other state. It has lots of influence from the French and that can be seen in its cuisine. I still miss beignets square-shaped fried pastries that could be called “French doughnuts” served with café au lait (which has blend of coffee chicory just like our south Indian filter coffee, but without milk) and the Po’ boy bread and Italian Muffuletta sandwiches. If you are a sea food lover there are the fried oysters, boiled crawfish, and other seafood; étouffée, jambalaya, gumbo, and other Creole dishes. Don’t think that New Orleans has no dessert in it cuisine, one of the famous one is Praline a candy made with brown sugar, granulated sugar, cream, butter, and pecans. The city also has notable street food] including the Asian inspired beef Yaka mein. 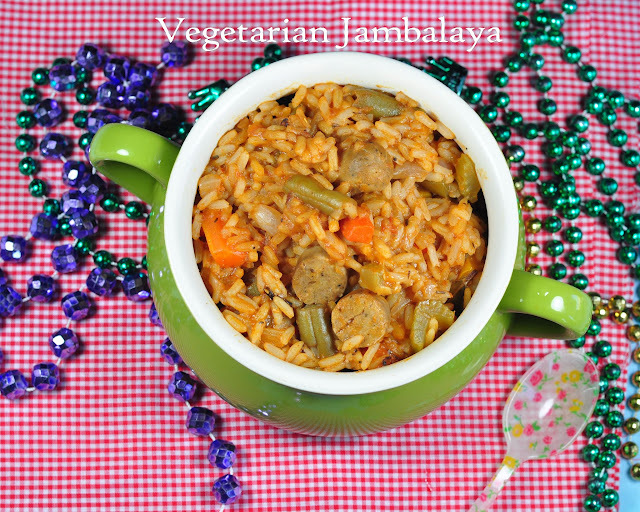 As an ode to love of that city I made this Vegetarian Jambalaya. Jambalaya originated in southern Louisiana by the Cajuns around the bayou where food was scarce, as opposed to the richer part of Louisiana. The word is a combined from Jambon from the French meaning ham, and Aya meaning rice in African, as there were many slaves in Louisiana at the time. Jambalaya is of two kinds, most famous one is Creole jambalaya and other is Cajun Version. In the first version, meat is added along with trinity (combo of celery, green peppers and onion) sauteed in oil and then vegetables and tomatoes are added and cooked followed by the addition of stock and rice and Creole seasoning with infrequent stirring. The second version, which is more characteristic of southwestern and south-central Louisiana, is Cajun jambalaya, and it doesn’t contain any tomatoes. First meat is browned in the pot, followed by the addition of trinity and sautéed until soft. Then it is cooked with rice and stock seasoning. Cajun version is brown in color due to browning of meat, where as Creole version is red in color due to use of tomato. Since I didn’t use any seafood or meat, I used vegetarian sausage and add vegetables to make a vegetarian version of Jambalaya. I was not comfortable of adding rice without washing, because of Indian tradition; I washed the rice and cooked with trinity, vegetables, rice and homemade vegetable stock. 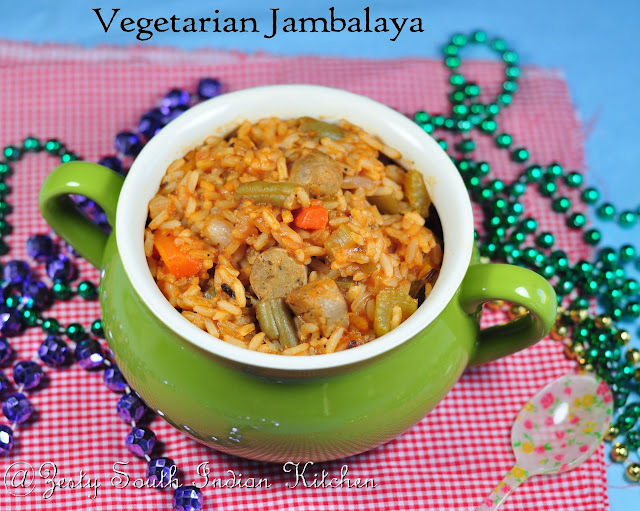 Even though I am not a fan of celery, I added it in this Jambalaya to make it as traditional as possible. My recipe was from here and here . 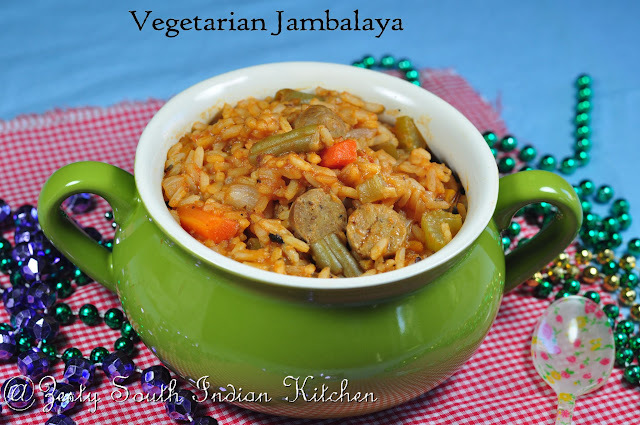 I made my version vegetarian jambalaya like this. Once you cut the veggies, half of your work is done. It was a delicious one pot meal. The entire family enjoyed it. Try it for yourself to do taste test, even though you might be far away from New Orleans. In a large pot, saute onion, celery and green pepper and garlic until slightly soft, about 5 minutes. Then add mocked sausage,orange bell pepper, carrots, then add chopped tomato and green beans. Add uncooked rice and allow rice to toast for one minute, stirring. Add tomato and broth mixture. To this add spices and salt. Reduce heat, cover and simmer for about 35 minutes, stirring occasionally, until veggies are fully cooked and rice is soft. I am linking this to My Favorite Recipes Event; Mela/ Carnival food guest hosted by Merry Tummy. Healthy and filling,loved the presentation.adipoli. healthy recipe..looks perfect and yumm.. I love New Orleans food and Jambalaya is one of my faves to make – your veggie version looks delicious! Great info on New Orleans…and your Jambalaya looks so mouthwatering. Great pictures!!! loaded with veggies and healthy.. So tasty jambalaya!! Wonderful dish! Lovely snaps! excellent awesome and tempting superb dish. I am drooling here. That is a lot of work and so many different ingredients.. the result looks really inviting! Looks yummy, healthy and tempting !! Healthy and Yummy recipe..thanks for sharing.. I have never tried this before. It looks very appealing. Your pictures are gr8! Loved it! i am so going to make this. where did u find veg sausage? Plenty of ingredients but all are worth for such a wonderful treat. We do enter the vegetarian fever from time to time and this will be a good try for me. Delicious option. Will try it without the sausage. I love such one pot meals – adding it to my “must try” list! wow so many veggies, interesting dish. looks delicious.. This looks like a healthy yet flavoursome and delicious vegetarian treat. Nice to know about New Orleans culture and cuisine. This one pot healthy meal looks so nice in beautiful ceramic pot. I always wanted to go to New Orleans it’s a place that I would like very much to visit. Perfect filling n tempting one pot meal…yummy,Swathi!! This one pot meal look awesome! This is delicious, had this at a restaurant one day. 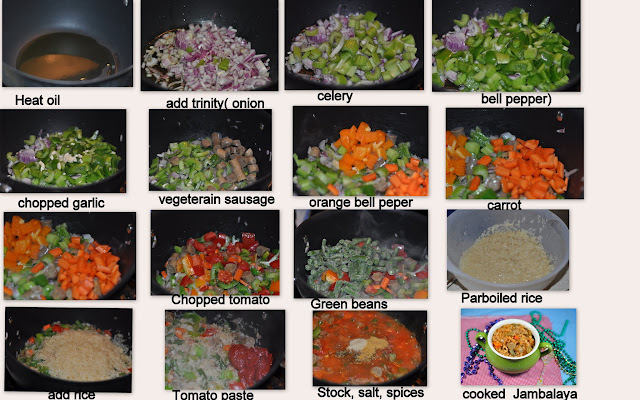 The first half is cutting the veggies, the next half is the simmering in the pot.. you would need keep a watchful eye to ensure it turns out perfect ! As yours has. Interesting vegetarian twist. Excellent way to add Celery in Indian cooking. Awesome filling recipe. Lovely one pot fulfilling meal Swathi. Looks luscious. This is just packed with good things Swathi making it very tasty! It would be a great comfort here – it’s still so cold. I would love to go to New Orleans too during Mardi Gras. wow, that is looking delicious & superb.